Makers and hobbyists looking to learn more about the Arduino platform may be interested in a new educational Arduino development board which is being created by serial Kickstarter entrepreneur Patrick Thomas Mitchell. The Arduino PlayBot comes with a wealth of project videos, together with a wide variety of different commented code samples all aimed at helping you increase your knowledge of Arduino and build more complex projects in the near future. Watch the video below to learn more about the educational projects that are possible using the Arduino Playbot. 1) Relay Control – The on-board relay will allow for you to turn high power AC or DC devices on and off though software. If you’ve never used a relay before, you’ll learn not only how it works, but how to control external devices with it! 2) Infrared (IR) Transmitter & Receiver – Learn how to take infrared signals from your TV remote control, and re-transmit them back to your television! One of the projects that I already have planned, allows for you to learn the TV on/off signal, and re-transmit it back to the TV when someone walks into the room. It makes for a great and spooky prank! 3) Active Buzzer – The on-board active buzzer can be selected via DIP switch, and can be controlled via software. I will be making a few different security system projects that will implement this little guy. 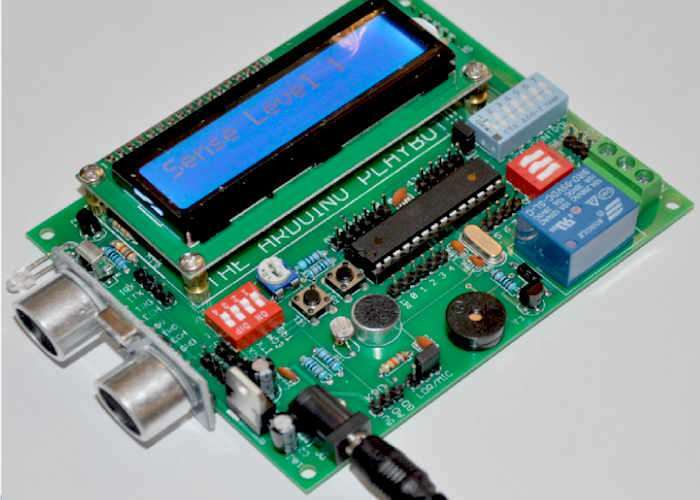 4) LCD Control – The on-board LCD can be controlled via software, and on-board DIP switches. The LCD will be used for most of the projects that I’ll be creating. You will also be able to turn the LCD backlight on and off with ease! If you’ve never used an LCD before with your Arduino UNO, you’re going to learn just how easy it is with the Playbot! 5) The Electret Microphone – That’s right! We’re going to make noise detectors, a clap-on/clap-off relay switch, and a double clap on/double clap off relay switch. You’re going to learn how to do it, and how it works! 6) The Variable Resistor – I’m going to show you a fun way of using a variable resistor to control sensitivity digitally through the use of a simple variable resistor and the analog-to-digital channels of the ATMEGA328-PU chip. 7) The Light Sensor (LDR) – The light dependent resistor is a favourite of mine. We can determine if the light in the room is bright or dark. We can also detect FAST changes in light. Do you have a laser pointer? Even if you don’t, you can imagine the possibilities. We’re going to have some fun with this component. 8) Servo Motor Control – There is a 3-pin selectible header that allows for you to plug in a micro servo motor. I’m going to show you how to do some fun things with it. Remember, all of the code samples will be fully commented, so that you can easily follow along! 9) The Keypad/PIR Sensor Connector – This three pin header allows for you to connect to a resistor based keypad, or a PIR motion sensor module. We will be using these for many of our projects. Even if you don’t pledge towards a reward tier that includes a keypad, or motion sensor, you can make your own keypad with my instructions, and you can use your own PIR sensor module if you’d like. Prepare to make motion sensor alarm systems, motion based pranks, and combination lock projects! 10) Ultrasonic Transmitter/Receiver Control – There is a 4-pin female header on the main board that allows for you to connect an HC-SR04 ultrasonic transmitter/receiver module. With this module, we will be able to create all sorts of fun projects together. This ultrasonic module was included in my last Kickstarter campaign as well. 11) The SEL (Selection) Button & The Reset Button – There are two buttons located on the Playbot labelled “SEL”, and “RST”. The SEL button is just a simple momentary push button pulled to 5v through a 10k pull up resistor. We will be using this button very often to communicate with the Playbot software. The “RST” button is a simple reset button. When pressed, the software loaded into the processor is reset.